Because of the success of previous vehicles such as JULIA & JULIA, HOPE SPRINGS, and last summer’s RICKI & THE FLASH, it appears that August is a good month to release a Meryl Streep movie. And her latest is quite a doozy – it’s a biopic of Florence Foster Jenkins, a wealthy socialite who was branded “the world’s worst singer” by critics in the 1940s. Jenkins was unaware that her singing was being laughed at because her husband, St. Clair Bayfield, played by Hugh Grant with his trademark suave grace, spent over two decades protecting his wife from who he called the “mockers and scoffers” by only allowing private recitals, and bribing reviewers. Set in 1944, the film follows the legendary heiress as she prepares for a solo concert by hiring Simon Helberg (The Big Bang Theory’s Howard Wolowitz) as pianist Cosmé McMoon to accompany her. The faces that the new hire makes upon first hearing Streep’s Jenkins’ off-key wailing are priceless. Grant’s Bayfield and David Haig as Metropolitan Opera conductor Carlo Edwards are used to keeping a straight face, but Helberg’s McMoon almost losing it repeatedly upon every foul note is the movie’s hilarious highlight. Bayfield dutifully takes care of Jenkins but their marriage is sexless, so after he puts her to bed, he scoots off to a separate apartment where he lives with his longtime mistress Kathleen (Rebecca Ferguson). Despite his best efforts, which include forbidding gossip columnist Earl Wilson (Christian McKay) from seeing his wife perform, the cat gets out of the bag when Jenkins makes a record of her performance of the “Bell Song,” the aria from the opera Lakmé that is treated like a classic novelty song – the kind people put on to laugh at, not with. Then the grand lady wants to perform a free public concert for US Army servicemen at Carnegie Hall. This is the expected climax, but it plays with the predictable laughter turns into applause trope appealingly. Nina Arianda has a small but sweetly crucial part as a gold-digging trophy wife of one of Jenkins’ fat, rich patrons who morphs from a mocker into a fan. Streep, who nails the horrible singing – just stay during the end credits to hear an original recording of Jenkins to hear for yourself – puts in another typically delightful performance. Despite her character’s historic lack of talent, Streep beautifully captures how Jenkins lights up when attempting to make music. It’s a winning work, but it doubtfully will result in Streep winning another Oscar. However, I wouldn’t be surprised if it got her another nomination as it’s exactly the type of film those old Academy voters go gaga for. Grant shines in his perfectly cast role, particularly when it comes to the film’s farcical last third that largely involves Bayfield trying to buy up every newspaper so that his wife won’t see Wilson’s New York Post review that panned her Carnegie Hall performance. Working from a screenplay by first-time screenwriter Nicholas Martin, Stephen Frears’ (HIGH FIDELITY, THE QUEEN, PHILOMENA) serves up a polished period piece which breezes along from scene to scene, even if it feels a bit too tidy and formulaic at times. 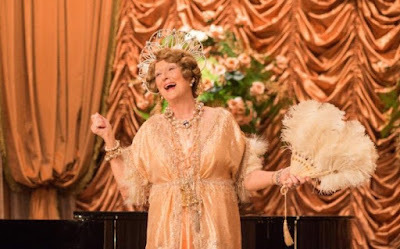 That familiar biopic formula frames FLORENCE FOSTER JENKINS right down to the concluding pictures of the real people, and text about all the players’ fates, but it doesn’t drag down the experience. It’s a fluffy human interest story, but it’s a good, witty one with top notch acting, and considering this fairly lousy summer at the movies, I’ll take it. See you again next August, Miss Streep!